Bigg Boss Tamil 2: Kamal Haasan used every opportunity during the opening night of the season to make a sarcastic remark in reference to the developments in the country's politics. Kamal Haasan is the host of Bigg Boss Tamil 2. 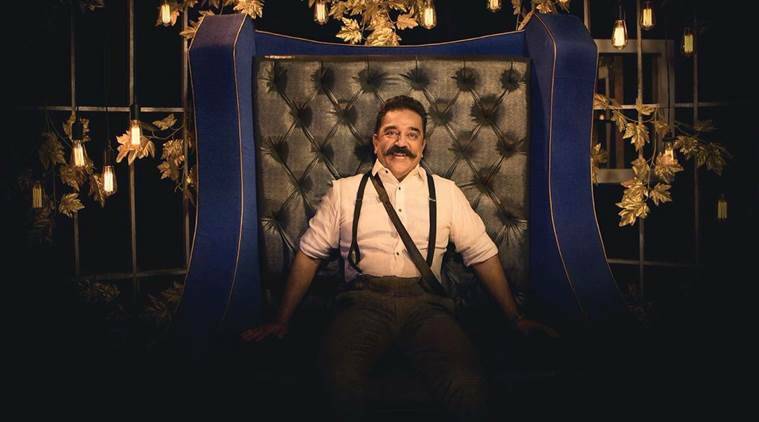 It took a few weeks in the previous season of Bigg Boss Tamil for Kamal Haasan to find his rhythm as a host. The launch event of the first season saw Kamal trying to be funny with self-indulgent jokes. It was followed by a dull affair of introducing contestants, while some seemed unsure or really unenthusiastic about being locked up inside a house for about 100 days. It was off to a not-very-impressive start. The second season, however, took off on a high note. Right from the start, Kamal knew exactly what he wanted to do and what was expected of him by the audience. He showed a lot of clarity, sarcasm, resolve and confidence. In fact, he set the tone for the show by making no bones about his intentions to use the show to serve his political interests. “I was asked why I do this television show. They don’t understand that this show gives me an opportunity to talk to so many people,” he said addressing the fans gathered outside the Bigg Boss house at EVP theme park in Chennai. “The happiness that I derive from getting so much love from you by being just myself is more than what I have received in the last 60 years,” claimed the 63-years-old matinee idol. And then he also made it abundantly clear that he will be talking a lot of politics during his episodes on the show. “There is a lot of things for us to accomplish together and I have a lot to say. So I will use this platform for this. Some will describe it as self-interest but I call it public-interest,” he argued. Making good on his words, the Vishwaroopam actor used every opportunity during the opening night of the season to make a sarcastic remark in reference to the developments in the country’s politics. The gem was Kamal’s inspection of the prison area. “There is no comforts here. Not even a fan. Looks like it is not really a prison,” observed Kamal. And it was not hard to guess the reasoning behind his analysis of the jail. The showrunners of the Bigg Boss Tamil also appeared more committed, confident and assertive to deliver a show that never falls short of drama. The first season took a while before the simmering tension among the housemates raised to the surface. The new season, however, introduced the conflict on the show at the very beginning. While 14 of 16 housemates may be yet to figure out who are their friends and foes, two contestants that entered the house already has a lot of awkwardness and mounting challenge to deal with. That two contestants are comedian Balaji and his estranged wife Nithya. Last year, the couple separated after an ugly public fight, followed by legal battles. To top it all, last season’s fan favorite Oviya was sent inside the house to upset the game plans of the housemates. While the 16 contestants are made to believe Oviya is competing for the title of season two, she is only there for few days as a guest. Kamal said she was called in to give tips to the contestants on do’s and don’ts that will help the housemates to survive on the show for a longer period. But, it was an excuse to introduce insecurity and tension among the housemates, who now may be under pressure as to how to overcome the unconditional support and popularity that Oviya enjoys among the viewers.